Since the last news item there have been many fascinating caterpillar sightings from the around the world. Including the first ones received from Afghanistan, Kazakhstan, Java and Bulgaria. There have also been many sightings from states all across the US as well as Canada, Spain, France, Malta, Greece, Hungary, China, South Africa, Seychelles and more imports into St Helena. There have been far too many to mention individually but images will be added to the galleries and those sightings of particular interest featured on species pages and news updates. Sightings are very much appreciated. Judging from enquiries Scarlet Tigers seem to be having a good year in the Uk. As in past years wisteria has been the foodplant of the first Vapourer caterpillar sightings. Unfortunately, some caterpillars haven’t been so welcome ! These have included Oak Processionary caterpillars in Richmond Park and many Brown-tails and Gypsy moths in both the States and the Uk. And the same ‘unidentified’ caterpillar featured last year has appeared again in the Seychelles. Many Mullein, several Small Eggar, Copper Underwings, Svennsson’s Copper Underwings and Red Underwings caterpillars sighted in various gardens have been of particular interest. There have also been reports of Puss moth eggs and recently hatched caterpillars on sallows in UK gardens. Ermine webs on blackthorn, apple and spindle have been fairly widespread. While most sightings have been of moth larvae there has been a large increase in butterfly caterpillars and sawfly sightings. 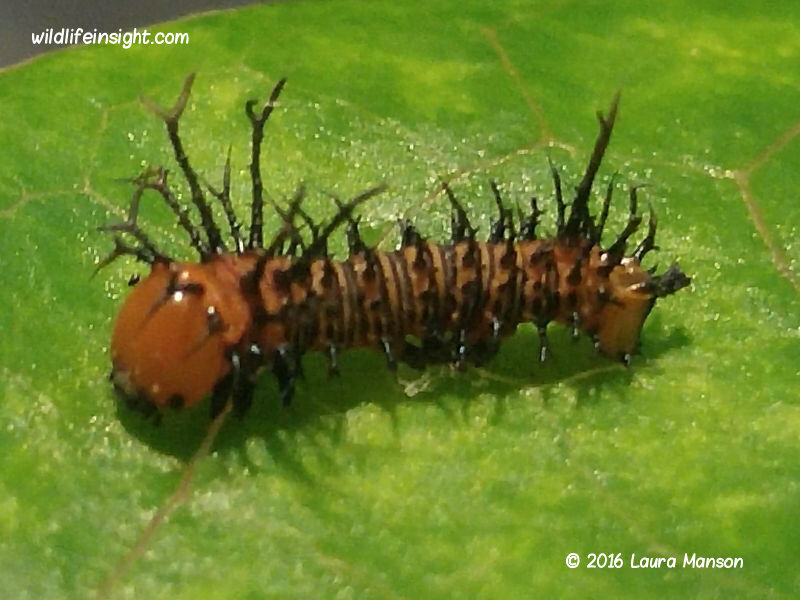 An urgent enquiry was received from Laura in Florida seeking the identity and foodplant of some recently hatched caterpillars crawling down the outside of a condo. These were Imperial moth caterpillars, Eacles imperialis, which Laura has now successfully begun to feed and will be rearing through. Her photos of the various molting stages (instars) will hopefully be featured over the weeks. Although time consuming to respond to its been encouraging to receive so many enquiries from schools and children wishing to experience the ‘magic’ of rearing a caterpillar to see the emerging moth and butterfly. Hopefully, with encouragement, some of these children will go on to contribute to our knowledge of the natural world. Unfortunately time doesn’t permit reports on many but they are appreciated and images with permission and accreditation will be added to the sites galleries in the future. Please note identifications enquiries are very welcome but with up to 20 a day being received things can become ‘strained’ and an old brain and memory bank scrambled! It helps if you can provide some basic information such as location/country etc see previous identification link. As ever, the help with identifications from experts from around the world is greatly appreciated. There is still much to learn about the early stages of many moths and butterflies. Whilst every effort is made to provide accurate identifications and information errors can occur.